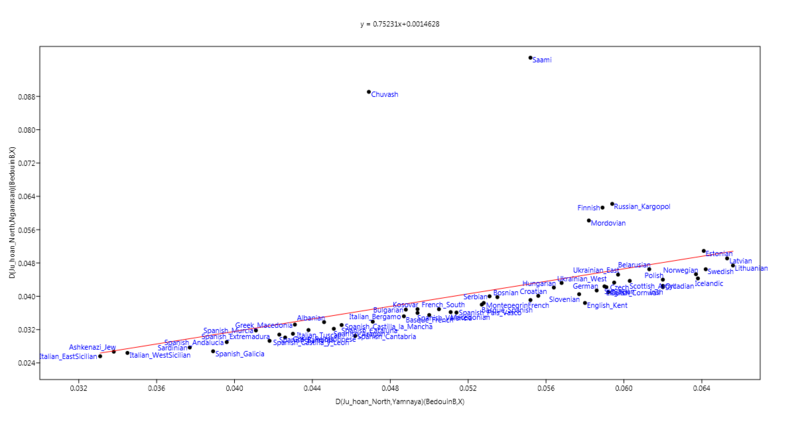 In agreement with our results, no traces of [Roma-specific] haplogroups H-M52, H-M82, or I-P259 were found in an extensive data set of 3136 non-Roma Europeans typed at similar resolution (472 Germans, 96 Danish, 340 Belgians, 90 Dutch, 370 Czechs, 520 Polish, 221 individuals from the United Kingdom, and 1027 Italians, from the Genographic project database, unpublished data), supporting our power to define founder lineages using our data set. With the exception of Hungary, for the reasons mentioned above, the presence of founder lineages in host populations confirms limited male gene flow from Roma to host. In contrast, male gene flow from hosts to Roma is much more frequent, although variable, ranging between 17% in Romania and up to 46% in Hungary. 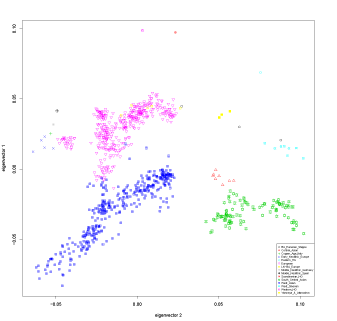 Abstract: Computational phylogenetics is in the process of revolutionizing historical linguistics. Recent applications have shed new light on controversial issues, such as the location and time depth of language families and the dynamics of their spread. So far, these approaches have been limited to single-language families because they rely on a large body of expert cognacy judgments or grammatical classifications, which is currently unavailable for most language families. The present study pursues a different approach. Starting from raw phonetic transcription of core vocabulary items from very diverse languages, it applies weighted string alignment to track both phonetic and lexical change. 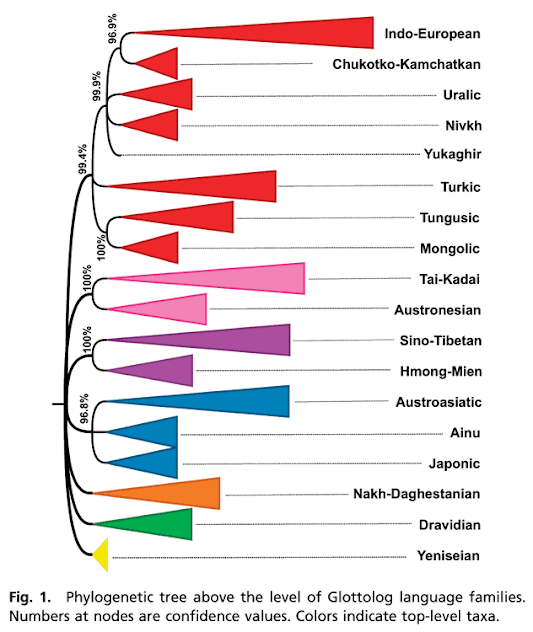 Applied to a collection of ∼1,000 Eurasian languages and dialects, this method, combined with phylogenetic inference, leads to a classification in excellent agreement with established findings of historical linguistics. 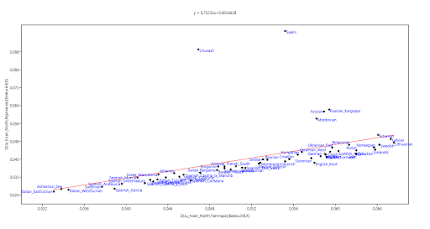 Furthermore, it provides strong statistical support for several putative macrofamilies contested in current historical linguistics. 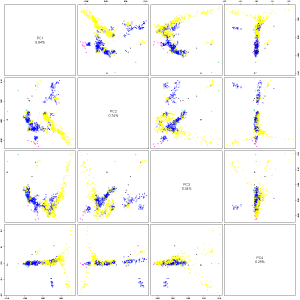 In particular, there is a solid signal for the Nostratic/Eurasiatic macrofamily. 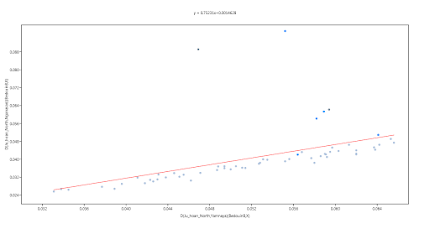 Below is a graph based on a couple of D-statistics. 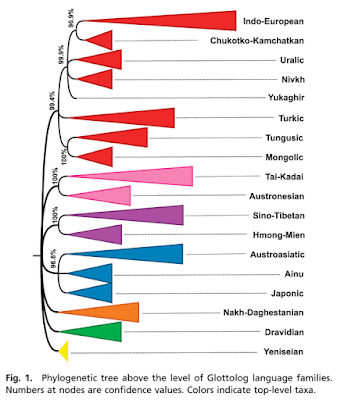 Note that out of the five Uralic-speaking groups, only Hungarians remain under the upward-sloping red line, clustering among Indo-European-speakers. On the other hand, the Indo-European-speaking Russians from Kargopol cluster with Uralics. However, Russia is a complex affair in this context, because much of the north and east of European Russia was Uralic-speaking until very recently. 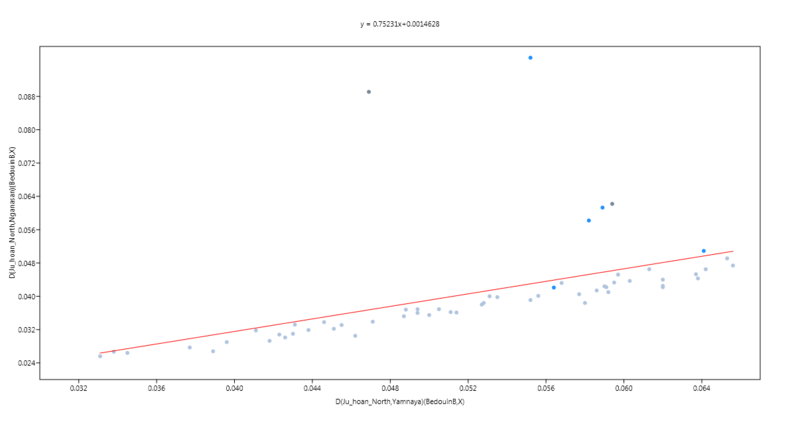 The relevant D-stats are available here. Abstract: The Kura-Araxes cultural tradition existed in the highlands of the South Caucasus from 3500 to 2450 BCE (before the Christian era). This tradition represented an adaptive regime and a symbolically encoded common identity spread over a broad area of patchy mountain environments. By 3000 BCE, groups bearing this identity had migrated southwest across a wide area from the Taurus Mountains down into the southern Levant, southeast along the Zagros Mountains, and north across the Caucasus Mountains. In these new places, they became effectively ethnic groups amid already heterogeneous societies. This paper addresses the place of migrants among local populations as ethnicities and the reasons for their disappearance in the diaspora after 2450 BCE. The abstract search is here. Feel free to post your picks in the comments. Lots of detail in this one, which is very much appreciated. 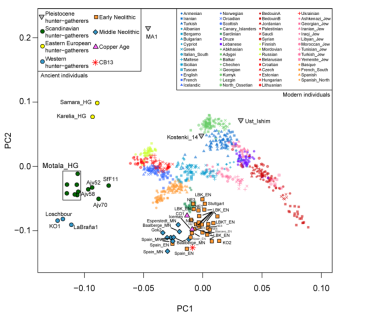 I. Lazaridis, D. Fernandes, N. Rohland, S. Mallick, K. Stewardson, S. Alpaslan, N. Patterson, R. Pinhasi, D. Reich, Genome-wide data on 34 ancient Anatolians identifies the founding population of the European Neolithic. ASHG 2015 abstract. Talk to be held on October 9. Update: the paper is now available and open access here. A paper titled "Ancient genomes link early farmers from Atapuerca in Spain to modern-day Basques", by Günther et al., will appear shortly in PNAS early edition. Here's the press release from Uppsala University. An international team led by researchers at Uppsala University reports a surprising discovery from the genomes of eight Iberian Stone-Age farmer remains. The analyses revealed that early Iberian farmers are the closest ancestors to modern-day Basques, in contrast previous hypotheses that linked Basques to earlier pre-farming groups. The team could also demonstrate that farming was brought to Iberia by the same/similar groups that migrated to northern and central Europe and that the incoming farmers admixed with local, Iberian hunter-gather groups, a process that continued for at least 2 millennia. The study is published today, ahead of print, in the leading scientific journal Proceedings of the National Academy of Sciences of the USA, PNAS. Most of the previous studies about the transition from small and mobile hunter-gatherer groups to larger and sedentary farming populations have focused on central and northern Europe, however much less in known about how this major event unfolded in Iberia. This time, the research team investigated eight individuals associated with archaeological remains from farming cultures in the El Portalón cave from the well-known Anthropological site Atapuerca in northern Spain. From these individuals who lived 3,500-5,500 years ago, the authors generated the first genome-wide sequence data from Iberian ancient farmers and observed that these share a similar story to those of central and northern Europe. That is, they originate from a southern wave of expansion, and also admixed with local hunter-gatherer populations and spread agricultural practices through population expansions. The authors noticed that although they share these similarities with other European farmers, this early Iberian population has its own particularities. The study also reports that compared to all modern Spanish populations, the El Portalón individuals are genetically most similar to modern-day Basques. Basques have so far – based on their distinct culture, non-indo-European language, but also genetic make-up – been thought of as a population with a long continuity in the area, probably since more than 10,000 years ago. “Our results show that the Basques trace their ancestry to early farming groups from Iberia, which contradicts previous views of them being a remnant population that trace their ancestry to Mesolithic hunter-gatherer groups,” says Prof. Mattias Jakobsson of Uppsala University, who headed the study. “The difference between Basques and other Iberian groups is these latter ones show distinct features of admixture from the east and from north Africa.” he continues. These findings shed light into the demographic processes taking place in Europe and Iberia during the last 5,000 years which highlights the unique opportunities gained from the collaborative work of archaeologists, anthropologists and geneticists in the analysis of ancient DNA. “One of the great things about working with ancient DNA is that the data obtained is like opening a time capsule. Seeing the similarities between modern Basques and these early farmers directly tells us that Basques remained relatively isolated for the last 5,000 years but not much longer,” says Dr. Torsten Günther. CB13 looks practically indistinguishable from the early Neolithic Spanish samples from Haak et al. 2015, which makes sense. The paper is open access. 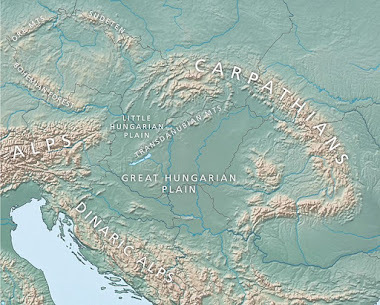 Abstract: The spread of farming out of the Balkans and into the rest of Europe followed two distinct routes: an initial expansion represented by the Impressa and Cardial traditions, which followed the Northern Mediterranean coastline; and another expansion represented by the LBK tradition, which followed the Danube River into Central Europe. While genomic data now exist from samples representing the second migration, such data have yet to be successfully generated from the initial Mediterranean migration. To address this, we generated the complete genome of a 7,400 year-old Cardial individual (CB13) from Cova Bonica in Vallirana (Barcelona), as well as partial nuclear data from five others excavated from different sites in Spain and Portugal. 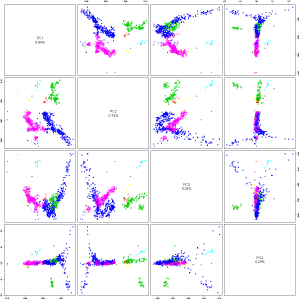 CB13 clusters with all previously sequenced early European farmers and modern-day Sardinians. Furthermore, our analyses suggest that both Cardial and LBK peoples derived from a common ancient population located in or around the Balkan Peninsula. 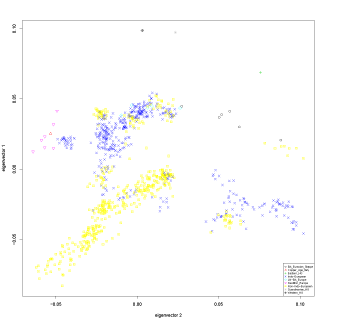 The Iberian Cardial genome also carries a discernible hunter-gatherer genetic signature that likely was not acquired by admixture with local Iberian foragers. Our results indicate that retrieving ancient genomes from similarly warm Mediterranean environments such as the Near East is technically feasible.